That the latest Captain America is perhaps one of the better Marvel entrants should come as no surprise, given how strong the first two of this trilogy have been. That it achieves this with a taut mix of action, thrills, a re-invented Spider-man and a film of some degree of consequence should be no surprise either. But that it manages to blindside you in its final act is the real surprise of the piece, whipping the carpet with such aplomb from under your weary cynical expectations of where the story may go. Taking a lead from Batman v Superman: Dawn of Justice, the 13th film in the Marvel Cinematic Universe is all about collateral damage, both of the physical and emotional variety. When Captain America's team inadvertently cause a series of deaths and destruction while trying to save the world, pressure grows to build a system of accountability for the Avengers and their ilk. But the proposed status quo fractures the Avengers, with Robert Downey Jr's Tony Stark in favour of it after his conscience is pricked by a mother whose son died in the events of Age of Ultron. However, Chris Evans' plucky straight arrow Steve Rogers isn't as in favour, fearing the bureaucracy could limit their abilities to save the world... and so, a show down is set between long time friends and new potential enemies. Distraction is the name of a lot of the game here (complete with plenty of globe-trotting and juggling many balls in the air): and while many will head to this slightly overlong flick with the delicious anticipation of an Avengers internal clash (which delivers in a set piece that does what you'd expect), the larger joy in among all the buzz of the clearly and concisely executed CGI clashing, is that Captain America Civil War has the smarts to realise the smaller emotional moments of devastation as sides are drawn and friendships tested are where the true strength of the red white and blue lie. 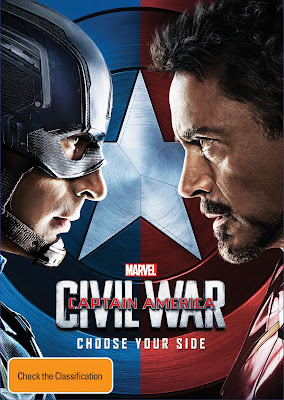 Captain America: Civil War is a film where the veracity of character moments shine and where the strength lies (something perhapsGuardians of the Galaxy realised earlier on and went to more comic extremes thereof) and not a routine rote CGI Smash-and-grab ending that has blighted the rest of these films. It's in the heart of the film and the heart within the film that the success of this one lies - Cap's main raison d'etre is to do right by his old pal Bucky aka The Winter Soldier (Stan in an expanded role from previous outings) and his ethics come into direct contrast and clash with Stark's ideologies. The series has been building to this - and that it pays that set up off well is perhaps testament to not only the investment we've had in the characters but that also our patience to get to this point was tested too. 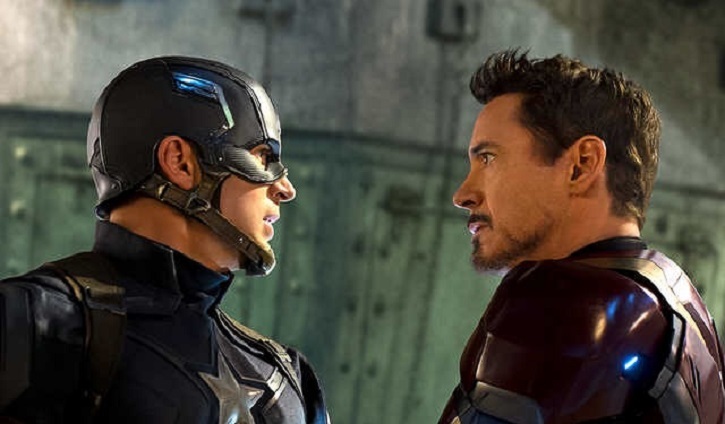 Both Evans and Downey Jr rise to the occasion, underplaying their hands respectively and helping ground the film in a more human edge that it needs. 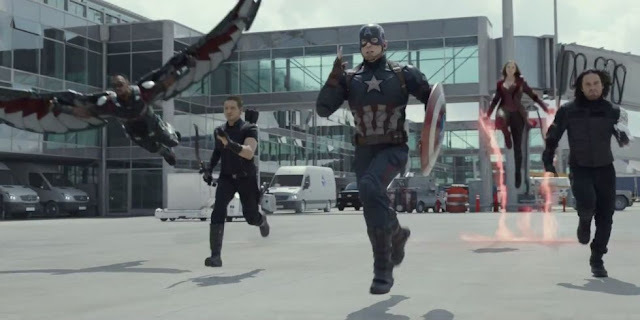 It also helps that Captain America: Civil War proffers up some thrilling set pieces of action that dazzle with effortless ease, as well as some throwaway humour to enhance the engagement. When the visceral action is shorn of the CGI trickery, there are chase scenes that elicit gasps and dazzle with their freshness of execution - both Joe and Anthony Russo have managed to up the game once again with a clear concise vision of what the audience wants and what will engage the non-fans. (Although there is perhaps one or two mano-a-mano sequences too many). Juggling the introduction of new characters into the MCU with ease and lack of distraction is not easy, but there won't be many who will come away feeling that the new faces are under-served (and perhaps Tom Holland as Spider-Man is the real find of the piece; a Peter Parker who is a kid from the comic-books). And don't even get me started on the energy that Paul Rudd brings to the piece with his spiky electric Ant-Man. Daniel Bruhl also deserves commendation for his mournful role - it's a smaller, more subtle touch that he brings and his involvement in the piece provides more than can be discussed in this spoiler-free review. 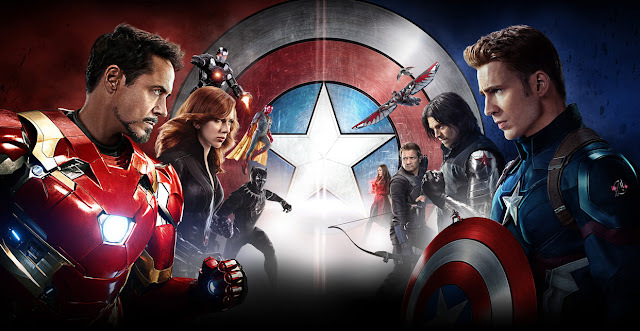 That said, Captain America: Civil War is not perfect. For a film about consequence, there are still troublingly less than realistic physical ramifications for the central gang - while there are thrills to see Cap and Iron-Man go at it, there's never really a feeling that either will fall (and perhaps nor should there be) but there is a feeling of seeding of buds of emotional unrest that will continue to ripple out. And some characters fall by the wayside as the third act plays out, simply fading away into the peripherary as their narrative use loses traction. Equally, at 2 hours 27 minutes, it's overlong in the final stretch but it's hard to say where the trim could have come from. This is a film that feels full, but never bloated; an important distinction as the past transgressions storylines come to a head and the Captain America trilogy wraps up. Ultimately, while there had been signs of apathy threatening to overtake the onslaught of Marvel Cinematic Universe films (stand by for Doctor Strange, coming soon), Captain America: Civil War emerges as a contender as one of the best of the run, thanks to character moments, limited chaos and a concisely executed and fresher vision of what a genuine action blockbuster can offer.